(Gazette photo) The southbound lane of Highway 213 in Orfordville is closed because of a sinkhole. 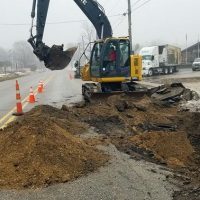 Public Works Director Karl Stuvengen says the sinkhole is only about 18 inches wide and appears to be the result of all of the water the ran onto the roadway when a water main broke last week. Stuvengen says the sinkhole occurred near a manhole so the whole thing is being replaced.